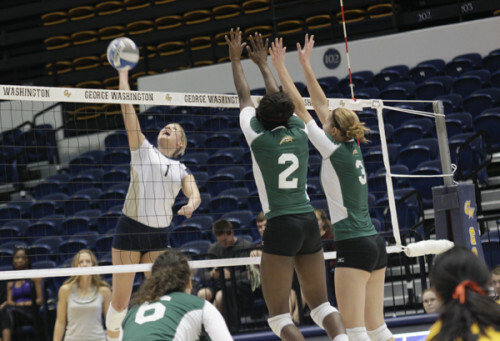 After having their five-game win streak snapped in a straight sets loss to Duquesne Friday, the women’s volleyball team rebounded with a straight-sets win of their own Sunday to complete the season sweep against George Mason (25-19 25-17 25-22). The Colonials (11-11, 6-2 A-10) were able to find their balanced attack that evaded them in Friday’s match. 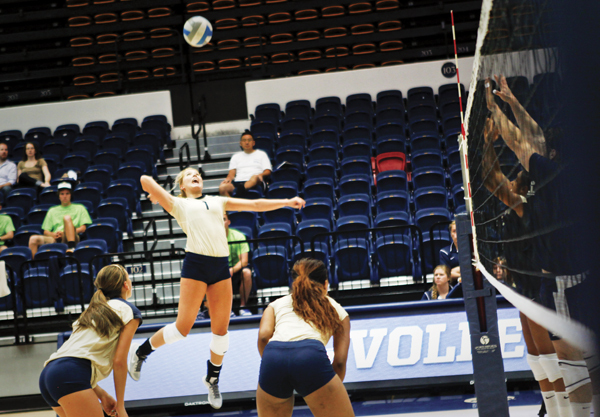 “We have a lot of attackers that we can use and that can be successful and so I think it’s to our advantage to try to balance ourselves out as much as possible,” said head coach Amanda Ault. It was that balance that led the Colonials through comfortable first and third set victories, with the exception of the second set coming from a strong effort by the Patriots (6-17, 2-7 A-10). Freshman Emily Clemens posted a double-double of 30 assists coupled with 14 digs, while sophomore libero Maddy Doyle tallied 12 digs. Both Osuchukwu and Garvik went errorless on the attacking front posting nine and seven kills respectively with Osuchukwu hitting .692. With the win, the Colonials add another point for GW in the Revolutionary Rivalry.